Dr. Suramat Suttisampat works to transform the lives of youth and families by using Buddhist principles of emphasizing positive thinking and speech and the abandoning of unskillful behaviors. She helps the children and families know right from wrong. She teaches the Buddhist 5 precepts, concentration and the development of wisdom. She uses mindfulness practice and meditation to reach these goals. She was President of Construction fundraising 30 million baht for the Buddha Tulakarn Chalemprakiat Meditation Center in Nakorn Pathom which is for youth who have been delinquent or violated the law. Youth with problems of drug addiction, family problems, psychological problems or aggressive behaviors come to practice there. 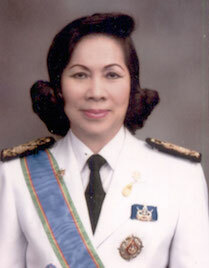 Many organizations work with her: the Social Public Health Foundation, Youth and Family Court, Youth Development Scholarship Foundation, the Tulakarn Chalemprakiat Hospital, Sirinthorn Child and Youth Training Center, Bann-Fah-Sai High School, the Karn-Chana Pi Sek Home, Equanimity Home and Training Center for Children and Youth, and Mudita Home. All of these organization come to workshops organized at the Buddha Tulakarn Chalemprakiat Meditation Center. The volunteers and social workers at the Center protect youth, defend youth, treat youth and rehabilitate them. Since 2009, she built another meditation center near her home for all people to come to and the employees of her company, United Foods, Ltd.
Dr. Surimat Suttisampat printed 10,000 copies of Buddha Jetiya for free distribution in devotion to the King’s Birthday.